Beijing's city government has been attacked by state media for failing to react to the smog that returned to the capital between February 14 and 16. The city government said in October 2013 that officials would use a four-level system to warn the public about dangerous levels of air pollution. Measures, such as halting factory production, restricting auto usage and temporarily closing schools, were linked to the levels. The warning levels are colour coded – starting with blue at the lowest, followed by yellow and orange, then red as the highest – and linked to the Air Quality Index (AQI) the government uses. The colour-coded warnings are announced on TV. Under a blue warning, residents are advised to reduce going outside and use public transportation; under a yellow warning people are advised to stay in their houses, and construction sites must take measures to reduce dust. However, none of the steps intended to curb pollution were taken when the air took a turn for the worse - a yellow warning should have been issued on February 14 when the AQI hit 337, but a blue one was issued instead. By the next day, the AQI soared to 419, and a yellow warning was issued. Air pollution and other forms of environmental degradation are a growing public concern. Experts say the smog plaguing many cities in China is due to three factors: coal burning, increased auto use and large-scale construction projects kicking up dust. Beijing also has to contend with dust blowing off the Gobi Desert to the west. State broadcaster CCTV took to weibo, the country's version of Twitter, to question why the city government took no action over the weekend. Net users reposted the comments for others to see and added their own angry views. Ma Jun, an environmental expert and director of the non-governmental organization Institute of Public and Environmental Affairs, said the problem was three-fold. The government lacks the ability to forecast precisely air pollution levels and officials lack the courage and ability to implement the measures they promised. Ma said that forecasting PM 2.5 levels is a new field that requires more study. "The capacity for accurate predictions is very important, especially when it is linked to policy measures," he said. Also, the emergency measures set out in the policy are difficult to put in motion, Ma said. For instance, temporary restrictions on auto usage could cause big transportation problems in a city already beset by them. Officials in Tianjin, Beijing's neighbor to the east, have had similar problems keeping their promises to clean up the air. 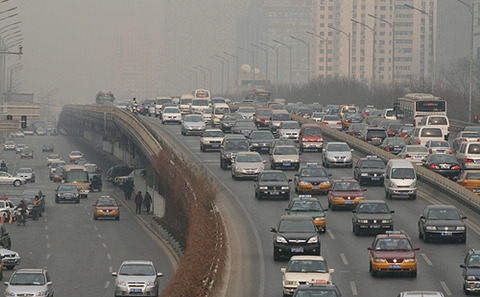 On December 22, the city government announced limits on auto usage would be linked with warnings on severe pollution. Hours later the city's traffic control department said no such steps would be taken. Ma said the government should aim for more practical measures, like halting the use of official vehicles and preventing trucks from carrying construction waste. Restrictions could also be put on power plants and factories. He also called for better coordination between Beijing and cities like Langfang and Baoding. People in those cities, which are in Hebei province that envelops the capital, also suffer from poor air quality blamed on polluting industries.